Aside from our stand up freezer I have three fridges (2 are kegerators). This adds up to quite a bit of storage space for perishable foods. As much as I can I like to take the time to pick up veggies from the farmer’s market but I also preserve as much as I can from our garden as well. Some things don’t do as well from frozen so they are what we eat as they ripen. Zucchini is one that we eat with abandon all summer long, extra is turned into bread and frozen for later enjoyment. The point is to avoid letting anything go to waste. You need to be proactive and protect your harvest. This is a ritual that gets done several times over the course of the summer as your harvest isn’t going to ripen at exactly the same time. When you have more than you will eat within the next day or two, it is time to doing a little extra work. For romas I prefer to seed and peel them. The method for preparing them isn’t hard but there is some standing around time. I use a pot of boiling water and flash chilling to prepare the skins for easy peeling. Then squeeze the seeds from the meat. This is great if you intend to save seeds. When I am working with beef steak or cherry tomatoes I have a slightly different preparation method. For these tomatoes I cut them into the desired sizes (roughly the size of cherry tomatoes when I cut them in half). Then I throw them in the wok or large pot and bring the whole mess to a boil. I boil these for about 10 minutes then flash chill them with frozen water bottles. This could be wrong but it works for me. I like gallon size ziplock bags for storing my veggies in the freezer. 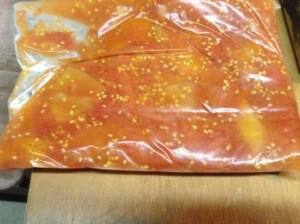 I tend to save all tomatoes in 1.5 pound freezer packs. These make a decent amount of sauce, so you don’t have to worry as much with left overs (big advantage to packaging yourself). After weighing out the veggies I make the packet lay out flat. Usually I lay them on a plate till they are frozen. This helps to keep the pack from leaking (just a bit of finagling to get the top right). Once they are frozen you can stack them or set them on end to take up less room. Even with a large amount of freezer space you can run out of room if you don’t plan for it. My family loves this because it saves us from cardboard like tomatoes during the winter months. We also use less canned tomatoes as well. 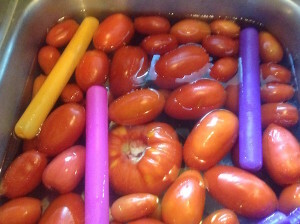 4 Responses to "Preserved Tomatoes #realfood"
Great ideas! Alas, I live in a tiny NYC studio apartment with a tiny NYC studio apartment refrigerator. This has inspired me to eat seasonally. Right now, it’s peaches (and other stone fruit) and tomatoes of every variety. In fact, I think it’s time for a grape tomato snack! 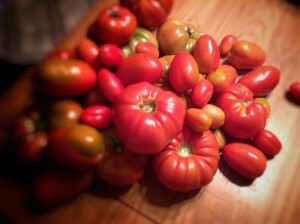 We have been feasting on fresh tomatoes pretty much nonstop over the past couple weeks. Mind you, it does help to have some space for gardening. We had fourteen plants this year. I haven’t been able to convince myself to can yet. Instead I tend to freeze everything I am able to. At some point this is something I should probably take up so I have some more options.